We offer you a new trip, that truly lives up to our slogan: Enjoy the nature and culture of Holland, maybe more than most of our other trips. 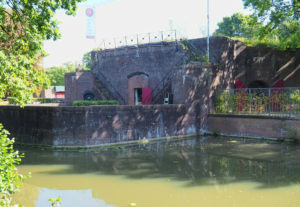 The Dutch Waterline is a 17th century line of defense, which was extended and widened in the 19th century. The aim of this line of defense is to flood land to make it impossible for attacking countries to advance. Flood the land by some 30-60cm, and it’s too deep for the infantry, and to shallow for the navy. A system of locks, sluices, forts, dikes, canals and fortified towns was built to sustain the Waterline. The Waterline was used three times in our history: In 1870, during the German-French war. In 1914-1918, during the great War, and in 1939-1940, at the start of the second world war. In the end, the extensive use of airplanes made the Waterline obsolete, but it was an amazing piece of engineering! We walk through the area of both the old Dutch Waterline (17th century) and the new one. We’ll pass many forts and other defense works which are still there (often with a different destination now). We’ll pass through and will sleep in some of the fortified towns, and in between all that we’ll walk through typical Dutch Polders, the old town of Utrecht, through the orchard area of the Betuwe, along some of the mighty rivers (on the dikes, but also through the floodplains, which are rich with nature). 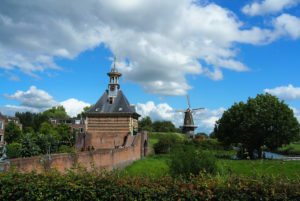 It is a varying trip that combines the typical Dutch nature with a historical defense line that is unique in the world.